(TORONTO – Oct. 4, 2011) The Art Gallery of Ontario (AGO) celebrates the long-standing patronage of Joey and Toby Tanenbaum with an exhibition comprising highlights from the masterworks the couple has donated to the Gallery over almost four decades. 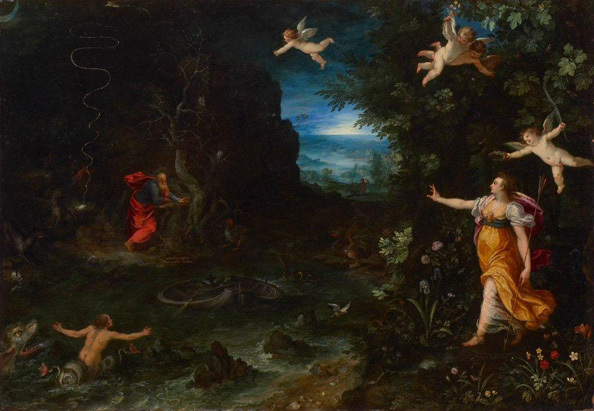 Featuring 28 Old Master paintings and five sculptures, From Renaissance to Rodin: Celebrating the Tanenbaum Gift is currently on view in the Walter C. Laidlaw and E.R Wood Galleries and Walker Court. The Tanenbaums’ love of rich imagery and visual depth, high drama and narrative tone is evident in the works of the exhibition. Spanning from the 15th to the 20th century, paintings by artists including Jan Victors, Artus Wolfort, Luca Giordano, Antoine Coypel, Jean-Baptiste Jouvenet and Thomas Lawrence capture mainly Classical and biblical themes. Of the sculptures on display, Bernini’s late Renaissance masterwork Pope Gregory XV is of particular note. Residing in the Walter C. Laidlaw Gallery, its wry characterization of the elderly subject earned the sculptor a knighthood from the Pope. Also featured are two Rodin sculptures (Eustache de Saint-Pierre and Andrieux d’Andres Vetu), beckoning visitors towards the exhibition from beneath the feature staircase in Walker Court. Joey Tanenbaum’s passion for collecting art was inspired by an encounter with Rodin’s Adam at the AGO when he was eight years old. An ever-evolving collector, his interests have spanned global traditions and styles including African, 19th century European, and pre-Columbian art. From Renaissance to Rodin is the first exhibition organized by Lloyd DeWitt, who became the curator of European art at the AGO earlier this year. It runs until Apr. 1, 2012. With a permanent collection of more than 80,000 works of art, the Art Gallery of Ontario is among the most distinguished art museums in North America. In 2008, with a stunning new design by world-renowned architect Frank Gehry, the AGO opened its doors to the public amid international acclaim. Architectural highlights include Galleria Italia, a gleaming showcase made of wood and glass running the length of an entire city block along the Gallery’s façade; and the feature staircase, spiraling up through the roof of Walker Court and into the new contemporary galleries above. From the extensive Group of Seven collection to the dramatic new African art gallery; from the cutting-edge works in the contemporary tower to Peter Paul Rubens’ masterpiece The Massacre of The Innocents, a highlight of the celebrated Thomson Collection, there is truly something for everyone at the AGO.